Manchester, UK – Manchester is a strange city; the birthplace of the Industrial Revolution, the world’s most popular soccer team, and the Trades Union Congress, its musical legacy is unparalleled. Bands such as The Hollies, The Smiths, The Bee Gees and – of course – Joy Division have changed the world. To quote Morrissey out of context: “Oh Manchester, so much to answer for”. And now to introduce another Mancunian songstress, with this strange and oddly challenging city deep within her musical DNA. Miss Crystal Grenade, has been described as “Shakespeares Sister fighting Amanda Palmer and Tori Amos in a dimly lit Victorian pub. With hand deformities.” And that’s a pretty good way of putting it. Miss Crystal Grenade explores the darker side of life, framed by the concept of Freak Show life of the late 1800s. 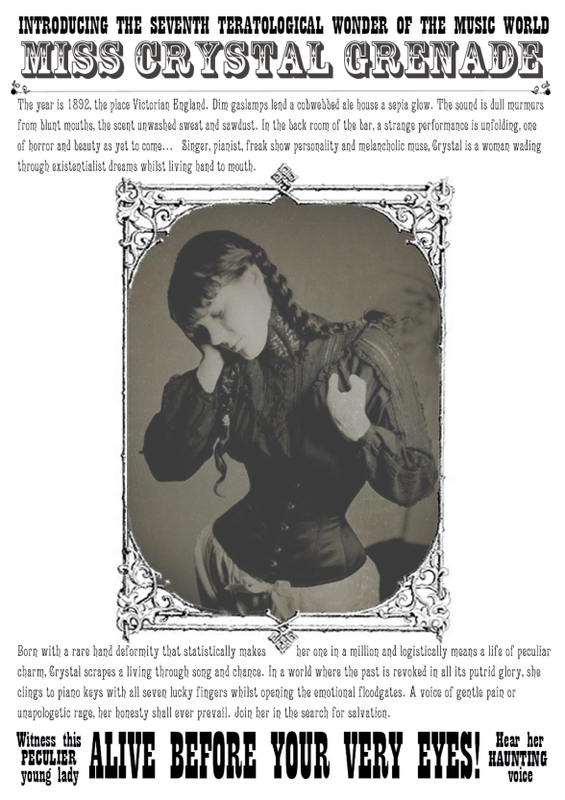 Whether she is indeed a late Victorian sideshow attraction who has only survived this long because of her fragile beauty and low cunning, or whether she is a character created by critically acclaimed singer and pianist Carol Hodge is a matter for discussion. Possibly the most infamous seven fingered pianist in the UK, Hodge is probably best known as the lady who sang alongside Steve Ignorant (once of Crass) on his Last Supper world tour. She now sings with Steve in the new acoustic project Slice of Life. Touring the world singing the songs of Crass gave Carol the confidence she needed to finally spread her gnarled yet unique solo wings. Miss Crystal Grenade’s debut album Lo! And Behold is due to be released in October 2013 by Gonzo. Produced by Nick Zart (The Modern, Matinee Club, Backdraft, Kactus), the aim of the album was to capture the raw emotion of the vocal performance, in as live a manner as possible. The songs twist tales of regret, malfeasance and death in all its various forms. Featuring material recorded by Harvey Birrell (Therapy?, Stereolab, Snuff, Stratford Mercenaries, Buzzcocks, Johnny Foreigner), at Southern Studios, Miss Crystal Grenade has the dubious accolade of being the last artist to record at this historic location. This entry was posted on Tuesday, October 15th, 2013 at 21:53	and posted in Crystal Grenade, Press Release. You can follow any responses to this entry through the RSS 2.0 feed.